How do these physical discoveries revolutionize the theoretical debate? Does it just point in one direction? Are there alternative theories about how man evolved? There are a lot of different dimensions to debates over human origins and human evolution. For example, there was a debate that began here at Berkeley in the 1960s, when the biochemists showed that very close relationship between humans and chimpanzees. The paleontologists said, "No, that can't be true. That split must be much older. You people are saying it's 6 million. It must be 20 million." A big debate ensued. We've recovered fossil data now that show the lineage leading to humans converging, converging on an anatomy that is much more apelike already at 5 million years ago. 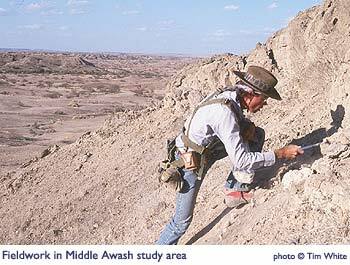 We have some fossils from this study area at 5 million, and other places in Africa that are all showing the same thing, that are strongly supportive of the biochemical data. So that's a scientific argument that's being solved. But there is another argument that goes on between people who think that we didn't get here by evolution at all, that in fact, we were created in our present form -- a human is a human and has always been a human -- and that model has its own predictions as well. In fact, that creationist model, in its most rigid form, in a young earth, suggests that everything happened in the last 4,000 years, and we were humans from the beginning, and it's all humans all the way back. That's interesting; that's a set of predictions. We can compare those predictions to what we're actually finding in Africa, and in every case we see a very strong evidence that humans have evolved, technology has evolved. This is a very fundamentally important point to be recognized, that we are biological organisms, and we share evolutionary common ancestors with close relatives like chimpanzees, more distant relatives like baboons, and that we have arisen from evolution. A recognition of that, and a recognition of the fact that not only have we evolved, but the entire world of life has evolved, in critically important in not only understanding where we came from, but also understanding where we're going. Building on this point, what are the philosophical implications that come to you as you are part of this process of unearthing these transitions from one life form to another? I think the most difficult part of all of this for humans, including myself, to map onto, is the enormity of geological time. We think that George Washington lived a long time ago, and that's a lot of generations; that's nothing compared to the people who built the pyramids. But when you look at the people who built the pyramids and compare it to this man who lived in Ethiopia 160,000 years ago, the enormity of geological time stands out. An appreciation of evolution requires an understanding of the enormity of that time. I feel privileged to be able to recover this kind of evidence. It is, in a sense, a time machine. You're able, as you take those sand grains away from the fossil, to see an organism that nobody has ever seen for the last 160,000 years, or the last 6 million years. It puts us in a very privileged position. As for the philosophical dimensions of that, what the ultimate causation of all of this was, well, that's not really in the realm of science. What we do is to figure out what happened. That's what we're all about. We've been very fortunate on this particular project to be in the right place at the right time, as "Mother Nature" is revealing our roots with every rainstorm. We go back every year with this team to find what else has surfaced as this erosion goes forward. And there's a lot that we still need to learn about the past. To somebody who is not an expert in this, what is quite amazing about this process is that such little pieces that are put together open the door to such amazing finds. I believe I read that of the three skulls you found in this recent discovery, the child's involved putting together two hundred pieces of bone, and then you discovered that it had, in fact, been polished and used in some way that might have some larger significance of what they did with the dead of that time. Right. We have an organism, modern humans, and we look around the world today in cultures, and we see a variety of mortuary practices expressed. We in the West, in the Judeo-Christian tradition, are familiar with burial and cremation. But Papua New Guineans, for example, had a ceremony, a mortuary ritual involving cannibalism, involving ancestor worship, involving keeping the skulls of their dead around. A variety of practices around the world have arisen that [reflect] a cultural evolution that has occurred. We would like to know, when did people start thinking about the dead? Chimpanzees push at a carcass, they show a little bit of empathy, but no burial, no ritual, nothing like that. But humans, all humans, have these kinds of rituals. When did that begin? We got a unique opportunity to look at this with the discovery of that child. 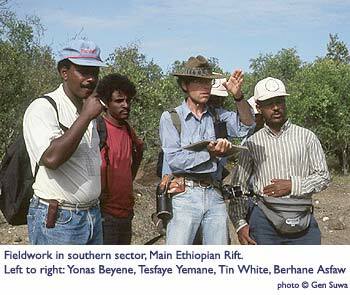 Dr. Berhane Asfaw was responsible. I was cleaning the sand off the adult, and so he got the job of putting this child together. It had shattered on the surface in, like you say, over two hundred pieces. We could tell how old it was because we found the erupting teeth, so we knew exactly how old it was. But all these pieces were put back together, and in the process he noticed on the base of the cranium, very fine cut marks. Now, this is a fossil, it's a stone. There's no way you can take even a knife and make a cut mark in this today. These marks were made when the bone was still fresh, by someone who lived at the same time. It was very carefully done at the cranial base. The head was not broken open, as some heads in more recent cannibalistic occurrences have been broken open. Very carefully manipulated. And it had a polish on it that indicated that people had continued to handle it long after the death of this child. At this site, literally a stone's throw from the child, is the adult. And another stone's throw, in the same horizon, is another adult. Not a single bone from the rest of the skeletons was found. So that's opened up a real mystery for us. What's going on with the rest of the body? What was the mortuary practice? It certainly tells us that by 160,000 years ago, there was a concern with the dead. You might call it the earliest spiritual feelings, being expressed archeologically through these tiny traces. And so it opens up [questions]. It's a cold scene -- there are no eyewitnesses that we can go and interview, we can't do ethnography, we have no videotape, we just have these traces of bones and stones on a landscape. So we just keep working at it. We are like forensic scientists working at a very cold scene. All we can say now is that some kind of a mortuary practice was exhibited by people who were our ancestors, who lived in Africa 160,000 years ago.